The Tokyo Hardcourt Bike Polo crew are hosting a tournament to go with the Cycle Messenger World Championships. Just because the “Worlds” of bike polo split from CMWC this year does not mean CMWC won’t have any polo. 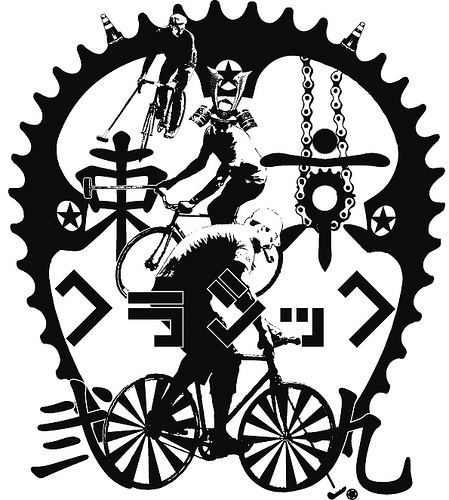 (It also does not mean that 2009 is the first World Championships of bike polo) Here is some text from Tokyobikepolo. Registration Fee: HDPE pipe for mallet’s head or Flanklin SHD Ball (or Mylec & Franklin’s “Glow in the Dark” Hockey Ball) per person. (both are hard to get in Tokyo!) a set of pipe and ball? two or more pipes and balls? fantastic! we don’t forget your support for Tokyo’s scene, never! Games will begin at 11:30 a.m (pick-up).Tournament will begin at 12:30 a.m.
final & 3rd place final is 10 min./5 points. We abide by the NYC game rule. losers of tournament, some local bike polo teams, and riders from Kyoto. all games are not serious! it’s fun games for our guest of CMWC & local bike polo players. We want to provide a hangout for all the bike polo loving messengers of the world. If you want to register, please email us at the below address with all the necessary information listed below (1~3). We will get back to you with the game location and details. We are also looking for referees. and MVP of the tournament. and some pics are here. This entry was posted by Doug D on September 8, 2009 at 1:05 am, and is filled under Bike Polo, Events-Past, Japan, Past Polo Events. Follow any responses to this post through RSS 2.0. Both comments and pings are currently closed.